What does good museum teaching look like? How do we as educators learn from each other? How do we constantly stay fresh and incorporate new approaches to teaching? What are our shared values for teaching in museums? These are among the questions that my colleagues and I in education regularly pose, and which led us to launch a project called Teaching Lab almost two years ago. Teaching Lab is not a concept born at Yale; it originated at the Brooklyn Museum in the 1990s as a way for its educators to convene, outside of logistical concerns, to talk about gallery teaching. Many of us work at such a pace that, without a structure like Teaching Lab embedded into our routine, reflection simply would not happen. 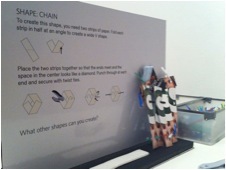 So when my colleague Jessica Sack introduced this great idea from the Brooklyn Museum, we adapted it to fit our needs at the Yale University Art Gallery (YUAG). Teaching Lab at YUAG has been a way to reflect, experiment, and collaborate on issues and ideas related to teaching and learning. Monthly sessions seek to explore intersections across traditionally segmented areas of work both in education (e.g. adult, family, academic, K-12, public programs) and Gallery-wide (e.g. curatorial, education, exhibitions, registrar, etc.) The aim is to facilitate dialogue, and perhaps collaborations, related to the project of museum teaching. Key to our sessions is that each is peer-initiated and led, with the organizer (myself) serving as the moderator. There are no defined outcomes for Teaching Lab, though some sessions have resulted in new projects. By way of example, a few departmental Teaching Labs have included: a session that brought together education teams from the YUAG and Yale’s Peabody Museum of Natural History for a discussion of different approaches to teaching with objects, especially those that can be classified as both art and artifact; a session to consider the Hirshhorn’s signature drop-in teen program, ARTLAB+, as a springboard for conversation related to how educators can, and should, respond to diverse audiences; and a session to consider a new digital app designed for a special exhibition, focusing on the self-guided visitor’s learning experience. It occurred to us that the conversations we are having relate not just to education but to the entire museum. Everyone at the museum, in effect, teaches in some capacity. What, then, might it mean to broaden the conversation? Will other staff want to participate? How do we make the dialogue both accessible and stimulating, to have the most widespread appeal? We started first by talking with people across the Gallery to gauge interest in the possibility of a staff-wide Teaching Lab. I realized early on that it was difficult to talk about something like this in the abstract, and I was often fielding the question: “So what do you want from me?” I didn’t really know the answer at first. After many departmental conversations about possible topics, effective structures, and anticipated barriers, we distilled the core ingredients from our departmental version of Teaching Lab that we wanted to maintain: that it be peer-driven, that it be conversational, and that it be experimental. We also decided that a natural place to start would be with objects, so we decided that the first staff-wide Teaching Lab would mine the concept of “close looking,” a term often used by colleagues across the museum to describe our teaching practice. We roughly sketched out what a day-long Teaching Lab could look like: three sessions, starting with looking and learning together, that would eventually zoom out to examine some of the bigger questions related to audience and expertise. We enlisted peers from across the museum to co-lead each session, and these colleagues would ultimately shape the day. On June 17, the YUAG Education Department presented the first staff-wide Teaching Lab. We invited all staff—from security guards to the Director—and offered three sessions over the course of the day. To our delight, almost 50 people of our staff of roughly 160, including four senior staff members and the Director, attended. We had representation from almost every department in the museum, from the Registrar to Development to Curatorial. With Close Looking as our frame, our first session was entitled “Close Looking from Multiple Perspectives.” Modeled on our typical three-objects/hour education-guided visit, this session was led by three colleagues from the Education, Curatorial, and Conservation departments. Guided by a single theme, which the three presenters mutually determined, the session was meant to showcase different approaches to teaching with objects. With few parameters, facilitators were asked to teach a single object for 20 minutes and to make sure it was connected to the other objects through the common theme. One group, for example, explored the theme of absence and loss: an educator considered it in a painting by contemporary artist Titus Kaphar, a paintings conservator discussed it in a 12th century Italian panel painting by the Magdalen Master, and a curator talked about it with a 1st century Roman portrait sculpture. A member of the Education staff then moderated a reflective conversation at the end to distill both the participants’ experience as well as the facilitators’. The second session was entitled “Multiple Frames: The Object in Context” and considered a single object through multiple lenses of analysis and understanding. To contextualize the processes of making and viewing art, participants spent half of the session in front of Jackson Pollock’s Arabesque, exploring how listening to jazz, reading quotations by and about the artist, and physically moving around a canvas on the floor, complicates the experience of viewing and interpreting a work of art. The group then moved to explore Pollock’s materials and methods in a studio session with one of our painting conservators, considering how experimenting with materials and methods might enrich our understanding of the art work. The last session of the day was a roundtable conversation, intended to help us reflect on the experiential components of the morning but also to zoom out to consider the less obvious ways that museums teach, how we understand the role of expertise among our staff and our visitors, and how we can be more responsive to our audiences. These conversations were illuminating, especially when the group was asked to brainstorm ways that teaching and learning happen outside of the guided visit or through interpretive materials. From conversations that security personnel have with visitors to the arrangement of postcards on the wall, the group came up with fresh insights on how the Gallery regularly “teaches” and how every staff member has a stake in our educational mission. This discussion was collegial and fruitful, and as we ended the conversation with time for suggesting future Teaching Lab topics, participants raised many ideas related to better understanding the experience of our visitor and continuing to mine what it means to learn deeply in a museum. They also evinced a keen and welcome interest in how we can collectively address issues related to inclusion and identity in our work, and plans are now underway to make this the topic of a future staff-wide teaching lab. We never could have imagined that the staff would be as receptive to Teaching Lab as they were. Since it required actually doing it to begin to grasp what this could become, the staff took a risk in setting aside almost an entire day to participate. As part of our own reflective process, the Education Department surveyed people anonymously to ask for their feedback. When asked to rate their experience on a scale of 1 to 5 (poor to excellent, respectively), 27.8 % rated the experience a 4 and 72.2% rated it a 5. When asked whether they would participate in future Teaching Labs, 100% responded yes. In the open comments section, participants repeatedly emphasized how meaningful it was to come together as a staff to learn from each other (and to get to know one another); they had expected that Education would be imparting best practices and were surprised that it was co-presented by colleagues from across the museum; and they were surprised by how much fun they had. Our Education staff, for its part, learned a tremendous amount in the process of reaching out to colleagues from across the institution, and we have been pleased about the new relationships that have developed as a result. I don’t want to overstate the impact of this one staff-wide Teaching Lab; in some ways, we have indeed returned to business as usual. But Teaching Lab at its core is about building a culture of learning, and this was a very positive step in that direction. Whether it be among those who are explicitly educators, or whether it be re-framed more broadly to consider and leverage the entire staff’s contributions to teaching in a museum, it is a powerful tool and structure for learning, for teaching, and for reflecting. As we turn our attention to the future of Teaching Lab, we can’t help but think—and hope—that this experimental and peer-driven model might lead to new ways of considering the project of teaching in the museum and take our work in interesting and challenging new directions. Featured header image: Gallery staff, led by Wurtele Gallery Teacher Tony Coleman, looking at this Equestrian Shrine Figure by Bamgboye of Odo-Owa. A is for Anatsui. B is for Brooklyn. C is for collaboration. Where the rest of the alphabet would go, I’m not so sure, but those first three letters reflect my experience working on Gravity and Grace: Monumental Works by El Anatsui, the retrospective exhibition at the Brooklyn Museum. Every show in every museum takes a dedicated team to pull it off, of course, but I’m taking this digital moment to highlight what’s been a particularly wonderful example of cross-departmental cooperation, which isn’t an easy thing, especially in a mid- or large-size institution. In this case, it led to a variety of ways to engage with the exhibition that ultimately (I hope) makes the show a great experience for our visitors. We have an in-gallery hands-on activity inviting visitors to use paper and twist ties to imitate some of the folds Anatsui and his assistants use to create his massive metal artworks (more on that in a bit). 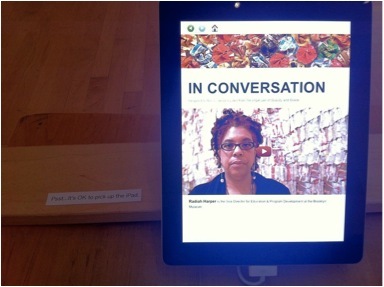 We have iPad kiosks that solicit visitor responses to the art on display using video questions posed by museum staff. We have QR Codes to scan for those seeking further context. And that’s in addition to our array of tours, workshops, and art-making classes designed for families, students, and adults. So many options for engagement! So how did all this come about, and what made it so collaborative? My part in it started when I took on the role of Project Educator for the show. The Education staff here divvies up a given year’s roster of special exhibitions to assign a Project Educator or two to each show. These folks represent Education’s voice in interdepartmental meetings and help shape education programming during the show’s run. Adding her enthusiasm and creativity to the mix was Sara Devine, the museum’s Manager of Interpretive Materials, who made sure we had a hands-on activity in an exhibition full of objects that, oh man, do you ever want to touch. We can’t touch the art, but thanks to Sara’s input, we can do our own tactile experimentation. Physically embodied engagement? Check. Multimodal sensory inputs? Check. Music to the ears of any art educator. Sara also enlisted representatives from our curatorial and education staff (and, again, Technology’s cooperation) to record several 30-second video clips that ask visitors questions about the exhibition and invite them to enter their responses on iPads throughout the galleries. I couldn’t have said it better. This opening up of the closed doors–be they metaphorical or literal–between departments is a way many museums approach (or are starting to approach) their work, and it’s an exciting prospect to look forward to. In Mike Murawski’s recent post about the Museum Education Division sessions at this year’s NAEA Convention, he noted that we’re in “a moment when many major museums are re-imagining (and, in some cases, totally disrupting) the traditional relationships between education and curatorial.” Sure, it may be testing uncharted waters, but when it works (as it has with Gravity and Grace), it can produce amazing results. How have you worked to open lines of communications across departments at your institution? Join the conversation below, and share some of the best collaborations you have been involved with. Once again, art and museum educators from across the country (and outside the US) begin to pack their bags and prepare to head to Fort Worth, Texas, next week for the National Art Education Association annual conference (March 6-10). And I thought it would be interesting again this year to offer another quick breakdown of the sessions being offered in conjunction with the Museum Education Division. There are some great sessions being offered this year, in addition to an exciting pre-conference program run by the Museum Division that will for the first time include lots of in-gallery teaching focused on some of the great collections in Fort Worth. The following stats are pulled only from sessions officially labeled “Museum Education,” so keep that in mind — there are certainly lots of other sessions across divisions that engage with museums, museum learning, and how museums interact with schools and higher education (and I always encourage museum educators to branch out and participate in sessions beyond our “comfort zone”). But within our own Museum Education Division, here is what it looks like this year at a glance. Click here to compare with last year’s numbers. While these issues may come up more frequently at AAM, ICOM, or other professional conferences with wider participation than arts educators and art museum educators, the issue is certainly something we, as a field, must be addressing as central to our work. 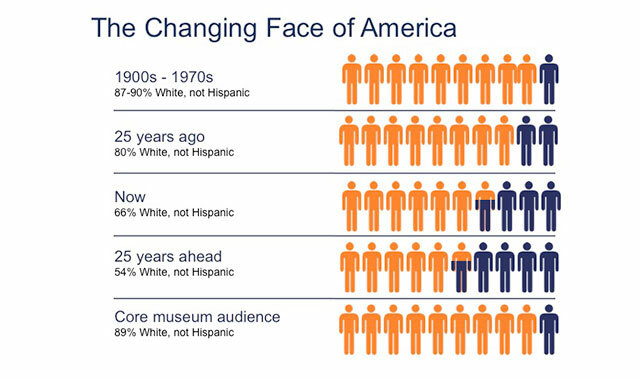 Perhaps these issues will find themselves woven into myriad sessions on visitor and audience engagement in general, but I do fear that when we use the words ‘audience’ or ‘visitor,’ there is a chance that we might unintentionally still be thinking of white, non-Hispanic visitors. I only present this as a potential spark for some conversation, and I’m always open to being corrected and proven wrong (please, prove me wrong here!). In addition to this blind spot, I also am concerned about the lack of sessions pushing core collaborations with curators — an area that was also severely lacking last year at NAEA. This year, the word ‘curator’ was only mentioned twice in any of the 75 Museum Education Division sessions. At a moment when I know that many major museums are re-imagining (and, in some cases, totally disrupting) the traditional relationships between education and curatorial, this lack of engagement via this year’s NAEA sessions is worth notice. Especially because I know that this issue will find its way into most of the dinner conversations each night in Fort Worth as well as the quick coffee chats we have in the halls between sessions, as it did last year. I am guilty myself, as we have not drawn much attention to this here at ArtMuseumTeaching.com. Given this, I would love to find ways to share the successes and failures of our curatorial collaborations and partnerships, and find ways to push this type of work forward. If you are doing work in this area, let’s get some posts up to shine some much needed light on these collaborations. Lastly, when I ran a quick analysis of the session titles and short descriptions this year, the most common words used (outside of “art” and “museum”) were, in order of frequency: community, visitors/audience, learning, education, and engagement. While I’m not sure how much this actually tells us, I continually find it interesting to examine the language and vocabulary we use to describe the work we do as museum educators (in fact, there is a session on this very topic on Thursday morning, “Intentional Language: How We Describe Museum Education Can Make All The Difference”). This year, the word ‘community’ rose to become the most common word in the session descriptions, followed by visitors and audience — perhaps showing a bit of a shift in how we are perceiving our work and its relationship with the communities in which we exist. A couple of the least common words to note are ‘curator,’ as mentioned, as well as ‘experimental’ (something we should be doing and sharing more and more). 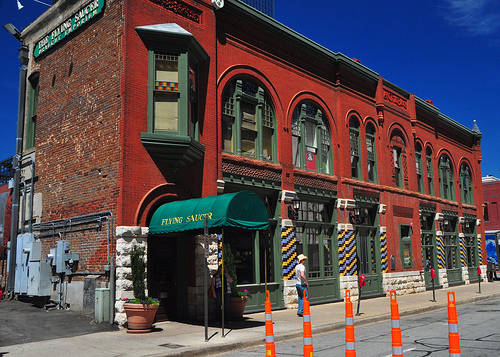 For those of you attending the NAEA Convention in Fort Worth next week, I would like to extend an invitation for you to join the editors and authors of ArtMuseumTeaching.com for a casual Happy Hour event on Thursday, March 7, from 5-6pm at the Flying Saucer (111 E Third St, a short walk from the Convention Center). We’re interested in continually extending and opening up this conversation, and wanted to find a moment at NAEA to pull together anyone who has been involved in the project thus far, as well as anyone interested in learning more. I look forward to seeing many of you in Fort Worth, and also getting more of your voices and perspectives involved in the ArtMuseumTeaching.com community!